Cailleach-Oidhche means owl, although it translates literally from Scottish Gaelic as "old woman (or hag) of the night"! Isn't that a beautifully descriptive name for them? As soon as I started swatching this pattern I started seeing owls staring back at me from my knitting and I knew what I had to name it. This is my first brioche pattern (and my second and third brioche projects!) and I've included a photo tutorial for all the brioche stitches used, as well as the cast on and bind off, and I think it would be a great project for anyone whether you're new to brioche or well practiced. Brioche makes the squishiest, cosiest cowls ever. I find that the short version is perfect for tucking into the top of my coat to stop drafts but the long version is perfect for when I'm at home and makes a gorgeous statement piece - I don't have a favourite but maybe you will! My favourite way to wear them is with the dark side on the outside and the light side folded down over the top so you can just see one little owls head - the dark side makes a little body for him! But for a more subtle effect you can wear it the other way round or skip the fold. The small version uses around half a skein each of two colours (so it's great for left overs) and the large uses a full skein each of two colours - I think they'd be great gifts this Christmas (especially the short one!). 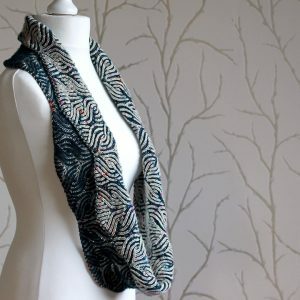 You can find the pattern on Ravelry and LoveKnitting and there’s 20% off automatically on Ravelry until midnight (UK time) on the 12th November.